Remove fender protector side cover (RH). Refer to EXT-28, "FENDER PROTECTOR : Exploded View". Drain engine oil. Refer to LU-8, "Draining". Remove oil filter using suitable tool (A).. WARNING: Be careful not to burn yourself, as engine oil may be hot. When removing, prepare a shop cloth to absorb any engine oil leaks or spills. Do allow engine oil to adhere to drive belt. Completely wipe off any engine oil that adheres to engine and vehicle. Oil filter is provided with relief valve. Use genuine NISSAN oil filter or equivalent. Remove foreign materials adhering to oil filter installation surface. Apply new engine oil to the oil seal contact surface of new oil filter. 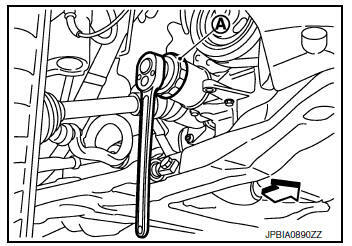 Screw oil filter manually until it touches the installation surface, then tighten it by 2/3 turn (A). Or tighten to the specification. Start the engine, and check that there is are no leaks of engine oil. Stop the engine and wait for at least 5 minutes. Check the engine oil level, and adjust the level (if necessary). Refer to LU-7, "Inspection".